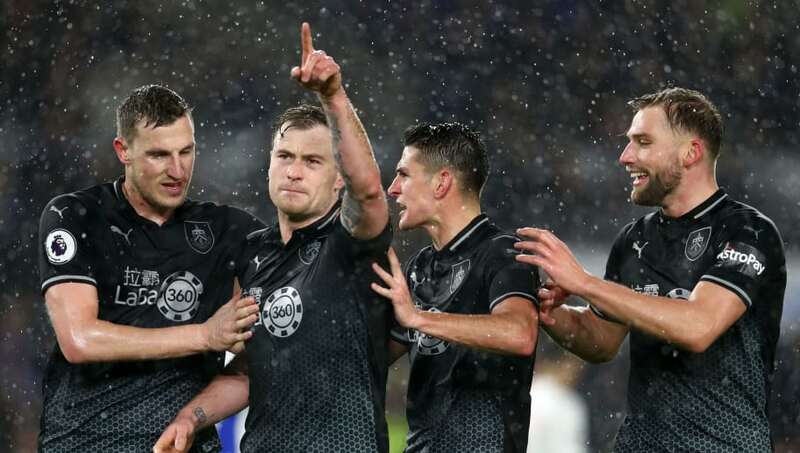 Two goals from Chris Wood and an Ashley Barnes penalty proved enough to secure a comfortable 3-1 win for Burnley over Brighton at the Amex Stadium. Both sides made bright starts to the game, with Tom Heaton making two big saves in the opening stages to keep his side on level terms. It was then Burnley's turn to get forward and they went agonisingly close to going ahead after Dwight McNeil's deflected strike came back off the crossbar, with Ashley Barnes' rebound header then also striking the bar in quick succession. Barnes played an inviting ball over the top of the ​Brighton back line and Chris Wood took full advantage of a slip from Lewis Dunk, latching on to the end of the pass and slotting the ball past Mathew Ryan and into the back of the net to make it 1-0 to the visitors. Brighton responded well to the goal and went on the front foot at the start of the second half, but ​Burnley then doubled their lead on the hour mark. McNeil drove at the Brighton defence and slipped Wood in on goal, who tucked the ball into the bottom corner to make it 2-0. There then came a moment of controversy with Brighton players begging Stuart Attwell for a penalty after it looked like Jeff Hendrick handled the ball in the area, but the referee wasn't interested and instead Burnley went up the other end and won a spot kick of their own after Barnes was brought down by Ryan. Barnes stepped up and duly dispatched it to make it 3-0. Brighton pulled a goal back through a Shane Duffy header, but it proved to be just a consolation goal as Burnley ran out comfortable 3-1 winners. Here's a breakdown of the night's events. A win for Brighton would've taken them six points clear of their opponents and the relegation zone, however it proved to be a nightmare of an evening for Chris Hughton and his side. They were left frustrated at the end of the first half, having been denied on a number of occasions by Heaton, only for Wood to go and score with the only two clear cut chances he had in the game. In the end they weren't clinical enough and they ultimately paid the price for it, with Brighton now right in the middle of the developing relegation scrap at the bottom of the ​Premier League. Starting XI: Ryan (5); Montoya (6), Dunk (6), Duffy (7), Bong (6); Gross (7), Stephens (6), Propper (7); March (7), Locadia (5), Murray (6). Substitutes: Knockaert (7), Bissouma (6), Jahanbakhsh (6). STAR MAN - There were very few positives to take for Brighton on the night, but Pascal Gross put in a solid performance for his side in the middle of the park. WORST PLAYER - It was a very quiet night for Jurgen Locadia who struggled to make any sort of impact throughout the game. Placed out on the right hand side, Locadia offered very little threat to Burnley full back Phil Bardsley and with his team in desperate need of a goal he was sacrificed with over 20 minutes left. A night to forget. The Clarets had only lost one of their last eight games heading into the clash with Brighton and it was clear to see why that was the case. It was a brilliant performance from Dyche's men, who were clinical with their chances and stern in defence, frustrating the hosts all afternoon and eventually secured a comfortable win that'll go down a treat with the fans. The win means they're now level on points with Brighton and have climbed out of the relegation zone all the way up to 15th in the Premier League table, a real boost for their survival hopes. Starting XI: Heaton (9); Bardsley (7), Tarkowski (7), Mee (8), Taylor (8); Hendrick (7), Westwood (6), Cork (6), McNeil (7); Barnes (8), Wood (9). STAR MAN - It was a vital win for Burnley, and they have goalkeeper Heaton to thank for that. The Englishman was exceptional between the sticks, producing a number of outstanding saves throughout the game to help keep his side ahead. Burnley's recent surge in form has coincided with a number of strong performances from Heaton, and today was no different with Dyche's men picking up a valuable three points largely thanks to the 32-year-old's contribution. WORST PLAYER - There were a number of impressive performers during the game, but as a result Ashley Westwood seemed to take a backseat in the game. He didn't necessarily have a bad game and it was more the case of his teammates outshining him, although he'll certainly have hoped to have had more of an impact on what was a crucial game for his team. The result is a real hammer blow for Brighton and they'll be hoping to get back to winning ways when they host Derby in the FA Cup fifth round next Saturday.